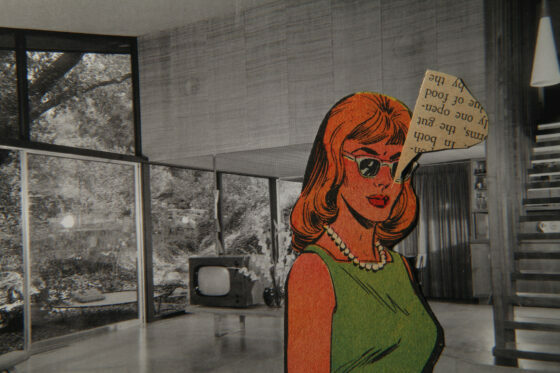 An anthology film in 12 chapters, Lewis Klahr’s animated mosaic Sixty Six is both greater than the sum of its parts and grander than the scope of its one-dimensional decoupage. Any attempt to describe the film leads to a maze of contradictions. Largely a work of stop-motion collage (a term the filmmaker favours to distinguish his practice from traditional animation), it is at once Klahr’s latest feature and a compendium compiled from years of short-form experimentation. Beginning in 2013 as the attempted reimagining of an unreleased 16mm film, the project soon expanded to encompass a multitude of digital miniatures ranging from three to 20-plus minutes in length. Combining outré visual sources––comic books, newsprint ads, pulp literature, and all manner of Pop-Art ephemera––with classical music cues and allusions to Greek mythology, this composite feature is the strangest of hybrids: a personal work of universal provenance. Another thing digital has allowed me to do is project on larger screens and in larger spaces, spaces that typically show 35mm. Since I always shot too dark, my 16mm films would often be challenged. Audiences often didn’t get the full colour or texture impact of what I was doing. In Super 8 it was even worse. But now with digital, I can be in a large theatre and it’s all there on the screen—every exposure tweak. Digital also gives me much more editorial control. And it changes the way I animate and the way I work with single frames, because editorially I can easily alter the sequence of a shot—I can use the same shots repeatedly since I don’t have to worry about reshooting for a negative cut. This editorial flexibility is really satisfying. But the greatest benefit has been that I feel like a Super 8 filmmaker again in terms of cost. Hard drives are inexpensive, I can make an entire feature for as much money as it used to cost me with 16mm to make an eight- to ten-minute short. It would have been financially impossible to make a work like Sixty Six—a work of this durational scale—on celluloid. Digital has granted me economic freedom.